In Australia there are 1,000’s of species of wasps and bees however here we’ll simply provide information on the ones that are most prevalent in Western Australia. Bees and wasps don’t cause constructional damage to homes and buildings and in fact their presence, in the main, is an essential part of the ecosystem. Their “nuisance value” tends to be derived from the varying degrees of physical harm they can inflict upon us. 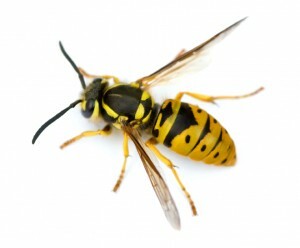 Stings from bees and wasps can effect humans in different ways …from being a mild annoyance to something that could be quite life threatening (depending on the individual) and for this reason it’s important that once you see a protracted presence of these insects on your property, to ascertain the risk level and call in Perth Pest Control to alleviate this risk. Perth Pest Control technicians have specific training for treatment of these pests and can perform this with no risk to you and your family. Honeybee – tending to swarm in spring and early summer, bees are prevalent throughout our state with over 800 species present and the Honeybee is considered the most ubiquitous. Their appearance is one of a stout body with yellow abdominal bands. It’s interesting to note that Honeybees are an introduced species (from the first settlers) whose purpose was to pollinate fruit trees and provide honey and beeswax. 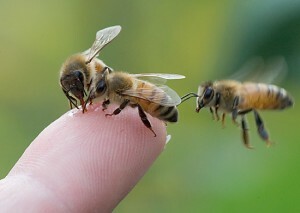 Of the bee species present in Western Australia, only the Honeybee will attack and sting aggressively . . . other species will sting but only under duress. 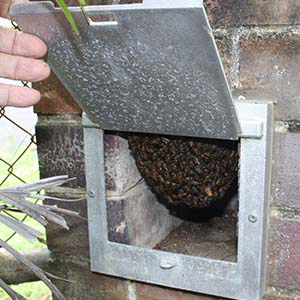 Honeybee nests are usually built in sheltered locations with easy access to the outside such as in wall cavities, roof spaces and in sheds and garages. 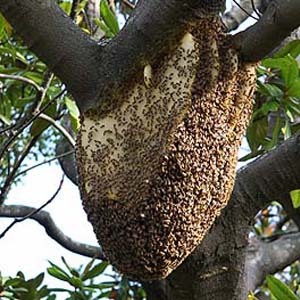 They may also collect in dense swarms where hundreds of bees cling to one another and hang down from a branch of a tree. Paper Wasp – are dissimilar to a Honeybee in that their body type is more slender with a narrow waist and small head with an overall body length of approximately 20mm. They have brown tinted wings and their black abdomen has bands bright yellow / orange in colour. 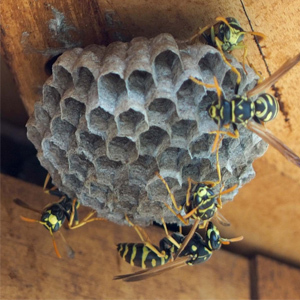 Paper Wasp nests are easily identifiable as a series of open hexagonal cells quite often shaped like an inverted cone that becomes rounder as more cells are added and are typically made in the open under eaves, corrugated fence tops or under tree branches. The nest itself will reach a maximum diameter of 10 – 12cm and some cells will have noticeable white caps. The Paper Wasp sting is an extremely painful one and different to the Honeybee, the sting of a Paper Wasp isn’t ripped out of its body and hence it can attack multiple times. They are not normally aggressive but will attack if their nest is disturbed. Paper Wasps main diet is the caterpillar and they do play and important role in our ecosystem in that they are natural pollinators that also help in the removal of small pests and insects. European Wasps – as with the Honeybee, the European Wasp is an introduced species and hence has no natural predators. 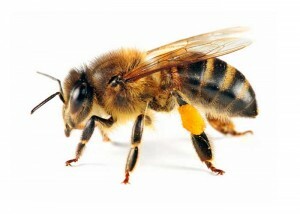 Their body shape is similar to a Honeybee (10 – 15mm long) with a bright yellow abdomen with some black banding. Their wings are clear and they have black antennae and their legs are yellow. 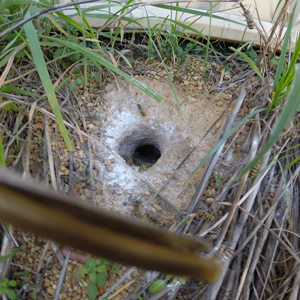 European Wasp nests are typically built underground and are visible by its entrance hole however they can also build nests in wall cavities, ceilings and in trees and logs. The diet of a European Wasp consists of meat, sweet food and sweet drinks. In their natural habitat in cooler European climates, leading into winter their nests will naturally disintegrate after the hatching of males and new queens however with Australia’s warmer climate, these nests don’t tend to disintegrate resulting in giant nests that can house hundreds of thousands of wasps. The European Wasp tends to have an aggressive nature and can sting multiple times particularly if its nest is disturbed. It’s worth noting that the Western Australian Department of Agriculture & Food has conducted a successful surveillance and trapping program for European wasps for many years and requests that any sightings of the wasp be reported to them as the goal is eradication of this species. These three species do have differences between them, both physical and habitual, that a casual observer should be able to identify. 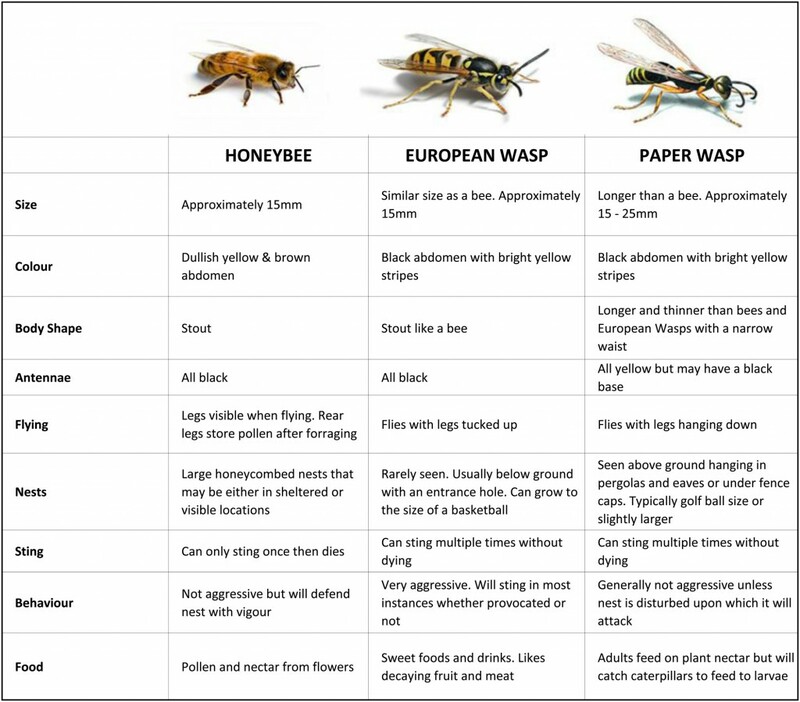 The table below highlights some of these differences but it’s worth noting that European wasps are far less prevalent in Western Australia than Paper wasps and Honeybees. Honeybees tend to be ubiquitous, and this is vital for our ecosystem, and in a local domestic situation when a wasp is noticed, the majority of the time it will be a Paper wasp. As mentioned earlier, the danger of bees and wasps isn’t so much what they do to physical structures, more the pain that can be inflicted upon humans. At some point in our lives we’ve all been stung by a bee or wasp but the effect can vary from person to person. 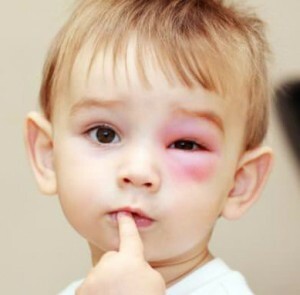 It may be nothing more than an irritation to one person and in another it may lead to more serious effects such as swelling of the sting site that enlarges over the next day or so and may take 5 – 10 days to resolve completely. In severe cases, one with an allergy to bee stings can develop a sever reaction called anaphylaxis which may lead to difficulty of breathing, the swelling of the tongue and throat and even loss of consciousness. Removal Recommendations – once the colony has been destroyed, it may require complete removal or, in the case of an inaccessible location, the sealing of that nest. Whilst this isn’t a part of our normal treatment service, we can advise on the best method to perform these operations to eliminate any future activity in the vicinity. 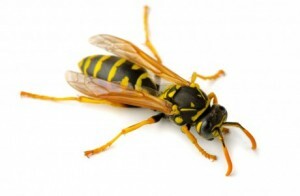 Contact Perth Pest Control for further details regarding eliminating the threat of bees and wasps from your property.